Jam is a great, creative controller in its own right, but it's best used as a counterpoint to the existing Maschine hardware. Wealth of step-sequencing modes are a joy to use. Completely overhauls the process of arranging and performing with Maschine. Pop-up browser is a little clunky. Doesn't engage well with some of Maschine's deeper editing features. NI's latest Maschine controller isn't Maschine 3.0 - in fact, it's not an evolution of the original hardware, even though it's still part of the Maschine ecosystem. 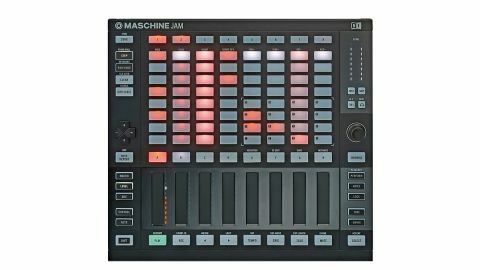 Maschine Jam provides a completely new way of interfacing with the Maschine software, which remains largely unchanged; one that neither supersedes nor replaces the original hardware, yet provides a very different user experience. NI's Maschine 'groove production' platform provides unlimited groups of up to 16 sounds or instruments, along with pattern sequencing, song arrangement, mixing, effects chains, plug-in hosting, automation and more. The software element runs either as a standalone application or plug-in, and is designed to be used alongside - and is only available packaged with - one of the hardware controllers. While the current hardware range runs the gamut from the compact Maschine Mikro to the flagship Maschine Studio, all variations are based around a 16-pad layout, providing a user experience closest to the classic MPC workflow. Maschine Jam flips this on its head. Firstly, it ditches the 16-pad format in favour of a grip of 64 smaller pads, which are backlit. Its other major addition is a bank of eight touchstrip faders that, broadly speaking, replace the eight Macro knobs of the original Maschine. It also does away with the built-in screens, the functionality of which is replaced by a number of pop-up windows that appear on the computer screen in response to button presses on the hardware. The main consequence of these changes is to move away from the sampler-style workflow of the original hardware towards one focused on 'performance' parameters, along with considerably deeper sequencing and arrangement capabilities. While this control layout is all new, the Jam hardware is the exact same dimensions as Maschine MkII. The only difference is its flat, rather than sloped, profile - but it does, come with a screw-on stand that angles the unit to sit flush with one of its siblings. As is standard with NI hardware, Jam feels well-built and durable. The only truly 'new' elements here are the touchstrips, which NI tell us have been designed fresh to be as responsive as possible. Connection wise, Jam features an expression input but ditches the MIDI I/O of the MkII/Studio. Beyond that there's just a single USB connection that provides buss power and connection to a host computer. Approaching Jam as an existing Maschine user can initially be a little confusing. It's easy to get hung up on the things Jam doesn't do as well as its siblings, so let's get these out of the way first. Using Maschine's browser with Jam is nowhere near as fluid without the built-in screens. The new pop-up browser is fine, but it doesn't fold through sub-categories in the neat way that screens and multiple rotaries allow for, and generally feels like a clunkier system. There are a few other functions that suffer from the lack of screens too. Jam doesn't really engage with Maschine's sample edit window in any meaningful way. It's possible to move start points and reverse sounds using the sampler's general controls, but there's no simple way to properly edit waveforms from the hardware. Together, Jam and Maschine MkII offer the most fully rounded controller experience we've tried. Some deeper parameters suffer from a lack of visual feedback too. It's possible to access most parameters with the eight touchstrips - along with the page navigation buttons along the edges of the controller - but there's no specific numerical feedback provided when adjusting parameters, beyond that provided via the touchstrip LEDs. You'll need to hover over a software control with the mouse to see the exact value you've inputted, which can be a pain for making specific parameter edits. Downsides aside, there's a lot that Maschine Jam does remarkably well. Firstly, Jam massively improves on Maschine's step-sequencing capabilities. Hitting the Step button switches the 64-pad grid into sequencing mode, with several different layouts on offer. The default mode provides 32 sequencing steps for a single sound, with a 4x4 grid of pads to the bottom right used for selecting sounds or finger-drumming/live recording. Hitting 4 or 8 along the top row of pads allows multiple sounds to be sequenced at once. In these '4' and '8' modes, the 4x4 pad grid disappears, dedicating the entire 64-pad grid to four 16-step or eight eight-step sequencer grids, allowing multiple sounds to be sequenced at once. In all modes, the buttons directly above Jam's pad grid allow users to toggle between sequencer 'tabs', so patterns aren't limited to the immediately available number of steps. Further still, a Shift press of the Step button turns the pad grid into a piano roll for melodic step sequencing. It's possible to use the pads in the 'classic' Maschine manner too, where the notes of a preset scale are represented left-to-right across the pads with the root note highlighted. The touchstrips also offer up some interesting performance possibilities beyond their effects and Macro duties [see left]. In their melodic performance mode, each touchstrip can be 'strummed' or 'plucked' in a uniquely expressive - if a touch imprecise - manner. This can be set up in three modes: Guitar, which emulates strumming across a guitar fretboard, Chord, and a user mode, controlled by the 64 pads. In all melodic modes, a pop-up window allows the user to set a root note and key via the Notes button and main rotary. This pop-up format works better here (as it does with other functions such as Swing or Tune). Lastly, Jam hugely improves arranging and performing with Maschine. Maschine's arranger has long been one of its weaker elements, but Jam's pads now allow Patterns and Scenes to be triggered in a manner similar to Ableton Live's clip launcher. Coupled with the capabilities of the touchstrips, it totally reinvigorates the experience of performing or recording extended pieces. Speaking of Ableton Live, NI has produced an extensive controller mapping that takes advantage of Jam's similarity to Live's interface, duplicating every function of the controller from Maschine into Live - which is a major bonus for Live users. We only have space to scratch the surface of Jam's capabilities in this review, but suffice to say that, even given its handful of limitations, it's a very powerful and impressive production system. That's not to say you should rush out and sell your existing Maschine though. Maschine Jam and the existing Maschine are effectively two sides of the same coin, with strengths and weaknesses that almost exactly counteract each other. While both are powerful and well-rounded controllers in their own right, by far the best experience during testing Jam was using it alongside an existing Maschine MkII. Coupled together, the two takes on the Maschine concept offer the most fully rounded controller experience we've tried - one which barely ever had us reaching for the mouse. If you're going to buy one, it's really worth getting both. Let's hope NI brings out some nice bundle deals to make this an affordable option!